The passing away of this colossus literary figure made a sudden thud in my heart as I didn’t expect such sad news such sooner. Yet, the demise of a nonagenarian doesn’t arouse many a feeling in people in general, but in me. It was a shockwave to me for many a reason. My real academic career began at Sri Rathnasara Maha Vidyalaya in Baddegama, a few kilometres away from the southern capital, the city of Galle. There, my Sinhala teacher was our famous dentist turned writer Gunadasa Amarasekara’s eldest brother Edward Amarasekara. He is one of the finest teachers I have ever found to sharpen my literary enthusiasm. He left no stone unturned to kindle our imagination and unlock our potentials to serve the prodigy in the rising generation. He always reminded us to read the free verse, novels, critical essays and many a writing by Siri Gunasinghe, Gunadasa Amarasekara, G B Senanayake, Madawala S Rathnayake, Mahagama Sekera et al. Siri Gunasinghe’s free verse style went very deep into my heart’s core revolutionizing my affective domain, not in uncertain terms. At that time I just thought that what would happen when these literary giants leave us one day. It has happened to a great extent. How could a literary follower of this great veteran silence his pen? Many an appreciation on his fruitful life would follow, but I quickened my pen to top the list. Much water has flowed under the bridge since Mother Lanka gained independence in 1948. In the tapestry of Sinhala literature, Siri Gunasinghe was one of the most prominent pioneers who made a clear boundary between pre-colonial writing and post-colonial modern writing in tandem with the above mentioned all time veterans. This great doyen of literary reawakening was born in the hill country. Panapitiya is a rural hamlet in Ruwanwella in the administrative district of Kegalle. The circumstances brought him to Kotagoda in Akmeemana in Galle where the Sinhala alphabet was initiated to him by his parents. He had his primary education at Kotagoda Sinhala School. His upcountry birth and the southern upbringing seem to have put him on a sound footing. Mahinda College in Galle was the Firestone that sharpened his literary prowess. He was able to secure a seat at the University of Peradeniya, then Ceylon University under Sir Ivor Jennings. He read for oriental languages there and with English literature. Subsequently, upon the successful completion of his studies, he was absorbed to the academic staff there in 1949. The department of Sanskrit gained a new lease of life under his stewardship and in 1951 he left the shores for his doctoral studies at the University College of London. He earned his doctorate from Sorbonne and returned with new vigour to serve his native land. He might have been driven by the well -known Sanskrit proverb, mother and the native land are more excellent than swarga. Professor Siri Gunasinghe was an intellectual of high calibre. It was quite evident in his writing on numerous topics. Metaphors and similes came flying to him when he took his pen for writing free verse, in my view, it was his forte. This great writer deserves to be credited for having inspiration from the west in this regard and giving an indigenous fervour to cater to the literary needs of the amateur writers in particular and the connoisseur. He sowed the fertile field to reap the harvest later. Sri Lanka was able to reap a bountiful harvest in the subsequent years. He was a man of letters par excellence. Sath Samudura, his maiden attempt in cinematography, took him to dizzy heights in filmdom. He could bag the film award of the year without any contender due to its artistic value that took the film industry to a new path. His pioneering efforts in the film industry paved the way for others to follow suit. His only documentary film Ranwan Karal attracted the film lovers and left another footstep in the sands of time, indelibly. Almost all the genres he touched illuminated with his wisdom and genius. His wisdom unfurled when he took the pen to versify his thoughts. Among his versification, Abhinikmana stirred me to a great extent as I was passing my formative years of self-learning. Mas Le Nethi Eta and Rathu Kekula didn’t play second fiddle to any literary work of that period. Sinhala fiction after gaining independence was detoured by Siri Gunasinghe to take the literary path of Sri Lanka to a new dimension. The Sinhala novel was induced with ultra-active intelligence and imagination for the amateurs to find new paths for its advancement. That is the quintessential quality stemming from his Miringuwa Elleema, Hewanella and Mandarama. The Sinhala novel had just cut the umbilical cord at the western labour room when he brought succour for her rearing. 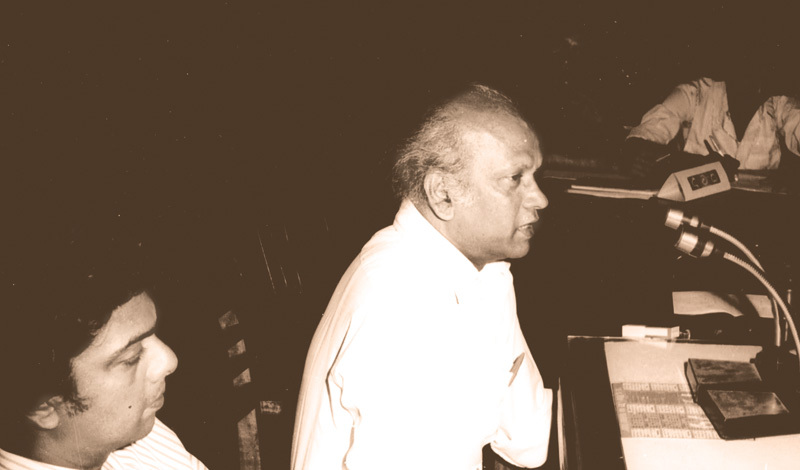 Siri Gunasinghe is not another name associated with Sinhala literary world; it is a name itself that stands tall and would live evergreen in our memory. If my memory proves me correct, once he sat in the big chair of the professor of Buddhism in a reputed university of the United States. In his numerous writings here, it was quite palpable to me that he possessed a profound knowledge of Buddhist philosophy. In the evening of his life, he had domiciled in Canada where he has breathed his last. He died a nonagenarian. The late maestro W D Amaradewa made his debut as a playback singer in his film Sath Samudura. Dear Sir, it is very poignant to imagine that you left us in a foreign clime. Yet, I withdraw some savings from my memory bank to pay a humble homage for your yeoman service to make us able to stand on our feet in the arena of literature.